My green thumb is showing up a little yellow this week. This is my bolting, buggy spinach. I sowed the seeds during the first two weeks of March, thinking they would do well in the cool weather, but the plants just never got going for me. I guess I need to do more work on my soil. Doesn't it always come down to the soil? Gardeners, plant and nature lovers share their photos on Green Thumb Sunday. See who else is participating. Christa, my spinach is bolting too, but I'm not sure what to do with it at this point. Yank it out? Let it release its seeds so I'll have more spinach later? What do you usually do? It really has bolted! My grandfather always used to say the answer lies in the soil. I wonder if high late Spring temperatures has something to do with this though. I am new to planting spinach and have some ready to plant out in my veg garden in the UK. Any tips on spacing, position and soil type would be great. Sorry about the spinach! You pictures for bloom day are great1 Doesn't look like a yellow thumb at all! I have nothing to offer in the spinach advice but I hope it works out for you. Oh wow, I don't know that answer. I live in what is called Foodland in Ontario. The Holland Marsh is the name. So we don't plant vegetables because we support the farmers of the area by buying theirs. My gardening buddy says it bolts when it gets too warm. I'm sure soil plays into it and rain and lack thereof. Have a great week! That whole soil thing is kind of important. Your next batch of spinach will do better. Hi. I had the same problem with planting spinach in spring. Eventually I moved to only planting spinach in Autumn. I just couldn't seem to time it right in spring and bolting was very common(and frustrating as spinach is a lovely vegetable). Thanks, everyone, for your comments. I think I will leave one plant in and collect the seeds for a fall planting. I have only tried planting spinach in the spring, but maybe it will do better in autumn's cooler temperatures. In the meantime... I'll be adding more compost to that side of the plot. I remember many years ago growing spinach and reading that it grew well in sandy soil. I don't know if that still holds true, but it might help ... perhaps it doesn't like too rich of a soil. I suppose the good part is that you can at least harvest some seeds. Though soil is important, I think the biggest factor in spinach bolting is the temperatures. We had some very hot days this spring, and my spring planted spinach looked like yours, but spinach I planted last fall in the cold frame gave me a very nice harvest. Also, some varieties are more bolt resistant than others, so you may want to experiment. Nice blog...I enjoyed the visit. I had big beautiful spinach plants this year. The secret? I plented as early as I could scratch the seeds into the ground. That was in febuary, and we even got some snow afterwards. I've enver had such healthy (and bug free!) spinach in my life. 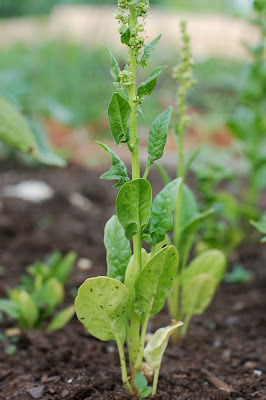 I planted my spinach outdoors in late February, 2 plants, in the same area, about 2 feet apart. One did wonderful, it's lush, green, and bug free. And the other one looks just like yours, except it's not bolting yet. It doesn't look like I'm going to get anything from that plant. I wish it would just go to seed already! I don't think there is any special trick, it could be the weather, it could be the soil, it could be the time you planted, it could be bad seeds... some mysteries are just meant to be mysteries. My spinach bolted too, and it didn't do this last year. It's in the same location, so I have to think it's been the hot, dry weather. Spinach doesn't like that, so it revolts and bolts. An Ailing Zucchini Plant - Already?